Commissioner of Police Augustine Chihuri recently got doctorate in policing. He apparently wrote a book on the history of policing in this country and the academic powers saw it befitting to confer him with a doctorate. Some of us were skeptical about such recognition but those who were happy for him at least hoped that with such a policing guru in our midst we would see an improvement in the quality of policing in the country. We had thought we would see the discipline in the police force improving. Unfortunately there has been nothing to show for a police force that is led by an individual who holds a doctorate. He must be the only police commissioner in the whole world with such a prestigious title but things are getting worse under his watch. A fortnight ago, Home Affairs Minister Ignatius Chombo announced that the police and Harare City council will be ridding the capital city of troublesome pirate taxis (mshika shika). The announcement came after a Harare Girls High student had lost her life in case of dangerous driving by a kombi driver. Pirate taxi drivers drive on the wrong side of our roads. They drive on pedestrian pavements and drive through red robots. They speed and practically do whatever they want regardless of what the road rules say. The general public is powerless. I once was told to disembark from one of these pirate taxis after I asked the driver to slow down. He told me that I needed to buy my own car if I wanted to be that ‘bossy’. I had to complete the remaining part of the journey on foot. The crackdown on pirate taxis has started in Harare and I am not sure if I should still be excited or fear for my life. Police are throwing spikes at these pirate taxis prompting the taxis to bolt in order to avoid arrests and paying fines. This creates a dangerous atmosphere in the central business district. One driver was intercepted in one way Leopold Takawira while heading to Avondale and reversed back all the way to Samora Machel Avenue and then sped away. The driver sped away with screaming passengers on board and almost mowed down innocent pedestrians. Passengers have become pawns in this dangerous ‘cat and mouse’ game between pirate taxi operators and the police. Police argue that passengers should not be using these illegal cars in the first place. Pirate taxi drivers say that they are in business because both government and the city council have failed to provide reliable public transport. As fate would have it the public transport system was run down when Ignatius Chombo presided over the Ministry of Local government which superintended ZUPCO. 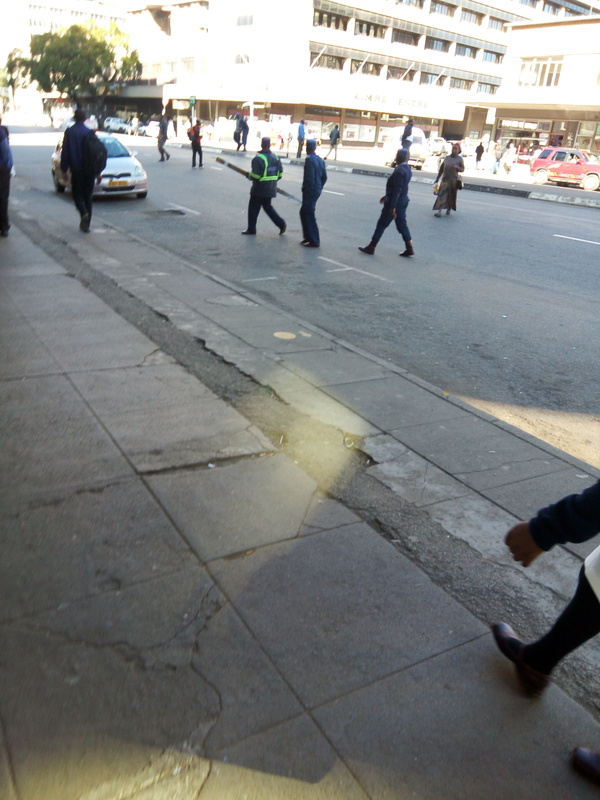 Police and their counterparts in the Harare City council are using dangerous methods to deal with this menace. Throwing spikes in busy roads at motorists that they know full well will bolt is tantamount to opening fire against a dangerous criminal at a busy market place knowing that the criminal may return fire. This has placed the lives of pedestrians and other motorists in danger. Police must find safer ways of dealing with this menace. A ‘gung-ho’ approach to policing that pays little attention to public safety has no place in a democratic society. Commissioner Chihuri must look at these strategies and justify his doctorate and abandon these colonial methods of policing that pay little attention to human life and public safety. At this rate the public will soon lose confidence in the ability of the police to maintain order and preserve public safety. Other ways that consider public safety must be considered in fighting this problem.